Qualcomm had introduced its Snapdragon chipset 845 last year and was used in almost all the premium phones of 2018. It was very popular among smartphones giant companies including Samsung, LG, Xiaomi, Asus, OnePlus and so on. For 2019, the company introduced Snapdragon 855 as its high rated chipset for premium smartphones. 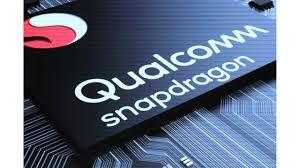 But along with Snapdragon 855 chipset, Qualcomm also introduced a new chipset named as Snapdragon 712 which is claimed to have a very fast processor and support quick charge 4+ features. 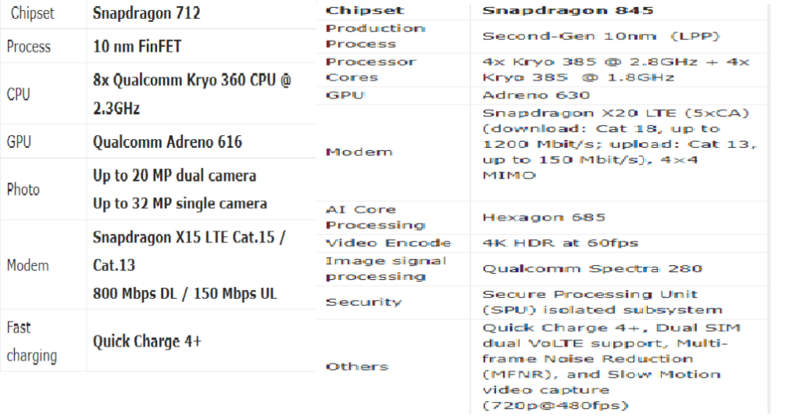 So, here in this blog, we are directly comparing between Qualcomm snapdragon 712 vs Qualcomm snapdragon 845 to see whether this newly launched Snapdragon 712 chipset stands in front of Qualcomm last year flagship chipset Snapdragon 845 or not. The last year’s snapdragon 845 was the successor or snapdragon 835 chipset. Its main highlight was the support for AI hardware, 4K HDR video capturing feature, overall enhancement in performance and low power-consumption. On the other hand, Qualcomm snapdragon 712 is the second chipset of SD-700 series. It is the successor to Snapdragon 710. According to the company, this SOC offers fast CPU, better battery life, connectivity and photography. Both Snapdragon 710 and Snapdragon 845 chipset are designed with the 10nm process so it will be very interesting to see the comparison result. Snapdragon 845 is designed with 10nm process with ARM’s DyanmIQ architect hence all the cores are present in the same cluster for better commutation. This reduces the memory access bandwidth and hence provides an improved performance. Its CPU is 4x Kryo 385 @ 2.8GHz + 4x Kryo 385 @ 1.8GHz that is clocked at 2.8 GHz . On the other hand, Snapdragon 712 CPU’s contains eight kryo 360 which is clocked as 2.3 GHz. Both are designed with 10nm process but Snapdragon 845 has second-gen 10nm (LLP) while 712 has 10nm FinFET process. The 845 chipset shares Adreno 630 GPU while 710 contains Adreno 616 but both the chipset contains Hexagon 685 AI Core processing. The quick charge 4+ is already supported by 845 which have also been added in 712. In camera department, Snapdragon 712 support 20 MP dual camera support or a single 32 MP shooter which spectra 250 image signal processing. On the other hand, Snapdragon 845 has Spectra 280 ISP that can capture high processed picture of up-to 16MP at 60 images per second. It supports ultra HD capture for video recording. If you look at the MP count, you will pick 712 as a winner but this is not all true. Snapdragon has Spectra 280 ISP which can collect more color as compared to Spectra 250 which results in better and sharper images. In RAM and its management department, Snapdragon 712 supports dual LPDDR4/4x RAM up to 8GB while Snapdragon 845 supports LPDDR4X up to 1866 MHz 6GB RAM (POP). It can be easily concluded from this comparision between Qualcomm snapdragon 845 vs Qualcomm snapdragon 712 that Chipset 845 outperforms snapdragon 712 in almost every department. So, the last years flagships phones will be still performing better than the smartphones containing Snapdragon 712. Do let us know your thoughts in the comment section.